I'm still here, grooving along with Santa (and all his buddies in development). I will soon be sending them all off to live with various preschool teachers, coworkers, grandmothers and neighbors. I gave up on holiday knitting long ago, but holiday felting is a bit more manageable; each of these little guys takes less than an hour to make, and they are usually well-received. Also, there's something rather, umm, satisfying about sticking a sharp needle into a squishy Santa. The holidays are not usually a difficult time for me; I love the lights, and the cheer, and I even like wrapping gifts. But I must admit that this year I have a touch of the blues. It may be the lack of sunlight; the stress at work; the unhealthy food that accosts me at every turn; and/or just the general feeling of being overwhelmed and scattered and tired. There has been some sad news in my local church community, and there is plenty of sad news in the global community. It is hard to take it all in, and to process it, and to not live in denial, while also keeping things in perspective and living in the moment. This weekend we will take our girls to get a tree, and we will all decorate it together, and I am hoping that this will bring me back to the spirit of the season. 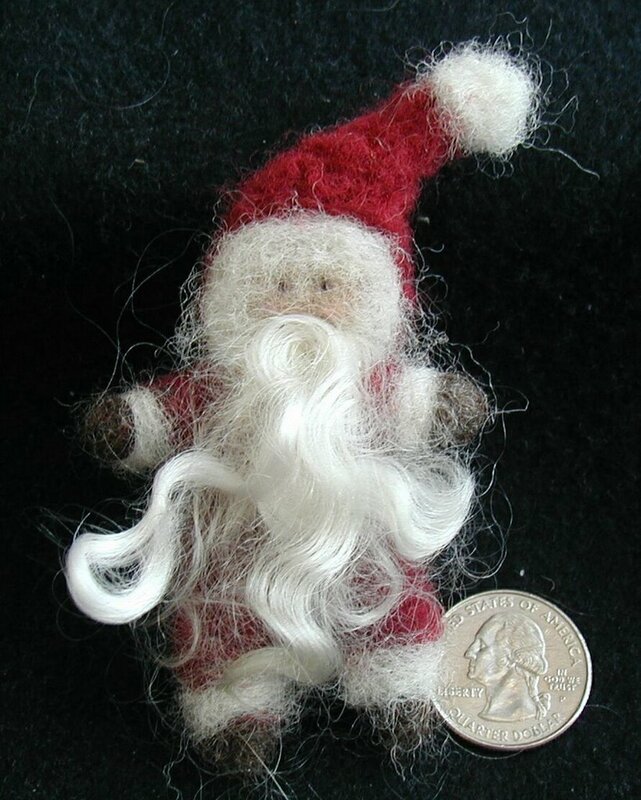 Edited on 12/8/05 to add: the felted Santa pattern came from a kit that I bought from Koenig Farm (at Rhinebeck) a couple of years ago. They have some nice beginner needle felting kits. I contacted the owner last year for "refill" supplies so that I could make more of the little guys. I made a few changes to the basic pattern, it's very easy to customize it.